Product #2322 | SKU BEUCA222 | 0.0 (no ratings yet) Thanks for your rating! 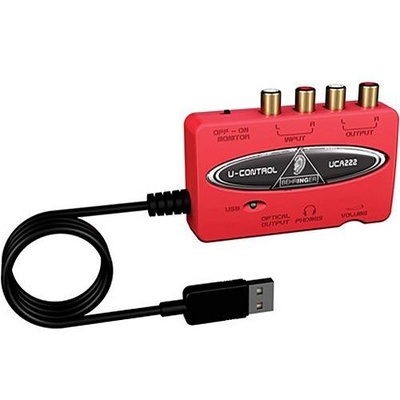 The U-CONTROL UCA222 from Behringer is a low-cost solution for getting audio in and out of a computer. The USB 1.1 interface is USB bus powered and features two analogue RCA phono inputs for connecting any line-level device, such as a mixer or tape deck, and two analogue RCA phono outputs for connecting active speakers or studio monitors. The interface also provides a stereo S/PDIF output on an optical connector. Headphone monitoring is via a stereo mini-jack with a dedicated volume control. No special setup or additional drivers are required, and wide computer operating system compatibility is available for both the Mac and Windows platforms. The interface includes a large selection of audio software.